Over the weekend we found ourselves, along with four other trucks, arriving in Moultrie, Georgia to pick up a load going to the Atlanta Airport. Our freight? 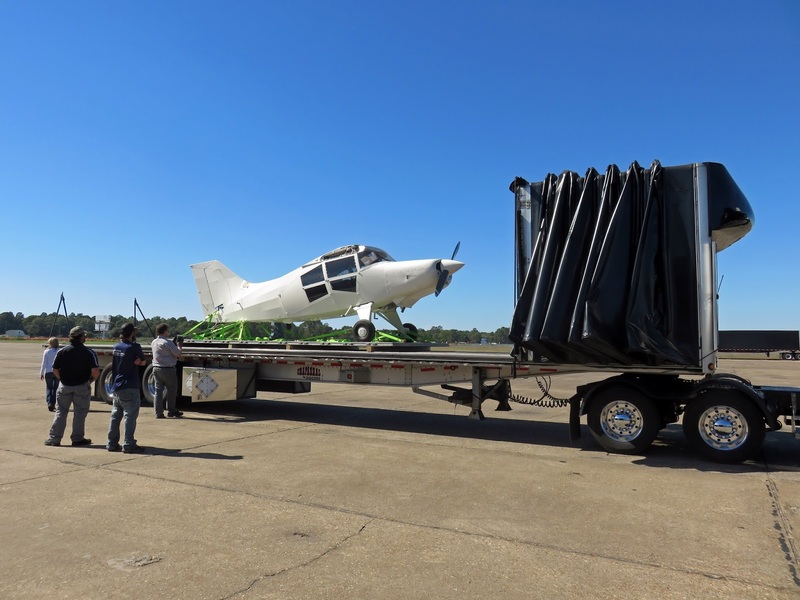 These cute little short take-off and landing (STOL) aircraft, being shipped from Maule Air, the world-renowned manufacturer of STOL airplanes. 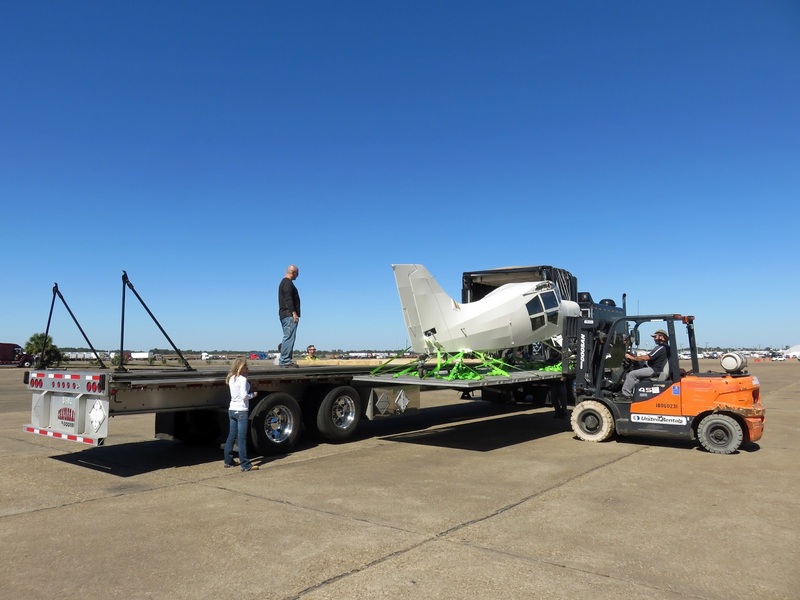 Maule Air is family owned and has been around for over 74 years. Founded in 1941 by Belford D. Maule - who started designing aircraft in the 1930s when he was 19 years old - the company first produced tailwheels and fabric testers. They moved on to design work in 1953, and in 1957 aircraft production began with the Bee-Dee M-4. The company manufactured and delivered 2,500 aircraft in its first 50 years of business. 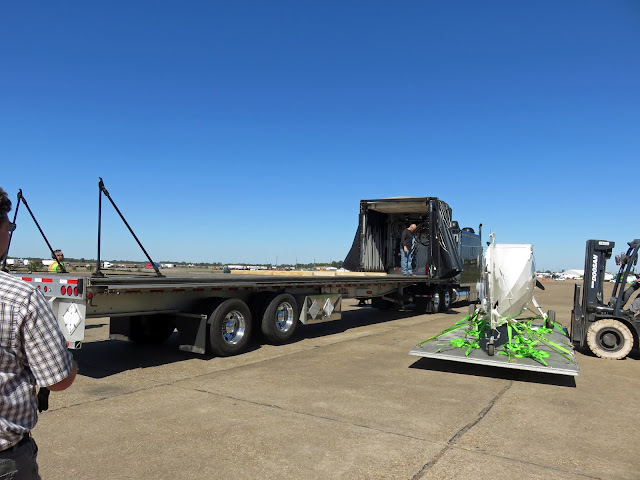 Here is our craft, strapped to an aluminum skid, ready to be placed on the truck. The matriarch of Maule Air, June Maule, was still at the helm of the company until her death in 2009 at the age of 92! I discovered this article and learned that she was inducted into the Women in Aviation Pioneer Hall of Fame, established in 1992 to honor women who have made significant contributions to aviation as record setters, pioneers, or innovators. The logistics team (the guy standing on the trailer and the woman standing on the ground next to him in the photo below) were there for every step of the loading process. They took pictures and made sure everything went off without a hitch. It was one of the smoothest and quickest loading times I've ever seen. I'd also like to note that this customer bought lunch for all of us! That's NEVER happened at any customer, ever, in the 11 years I've been on the road. What a pleasant surprise! 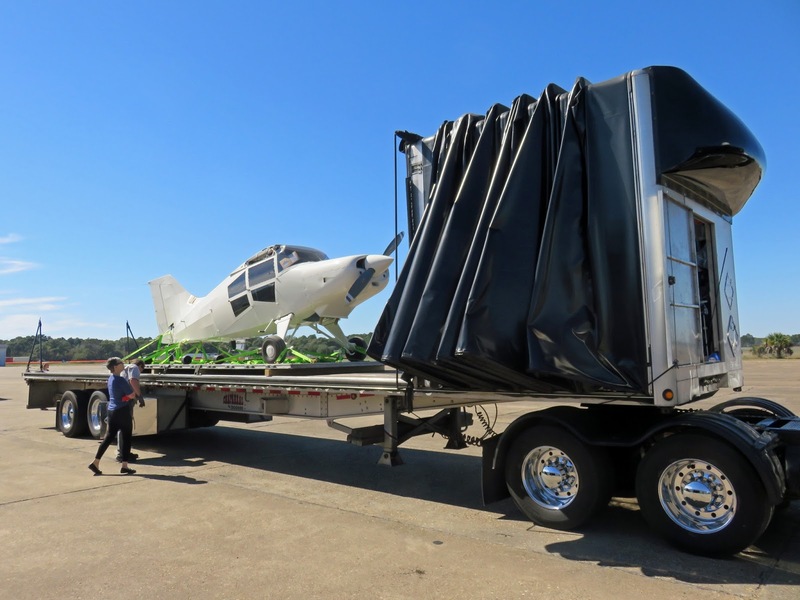 Once on the trailer, Ed strapped down the plane, which required the straps to go over the skid the aircraft was secured to rather than over the aircraft itself. Any pressure on the aircraft body could damage it. 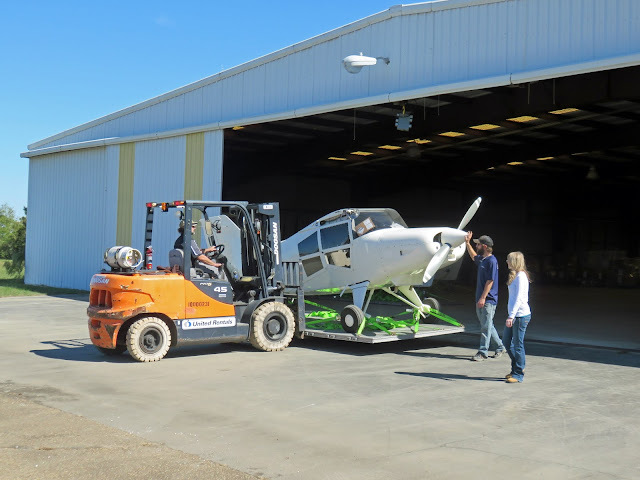 STOL aircraft have short runway requirements for takeoffs and landings. They're good in areas where the runways are challenging - in high altitudes, covered in ice, dirt strips, patches of grass, or even on water (when used with floats). 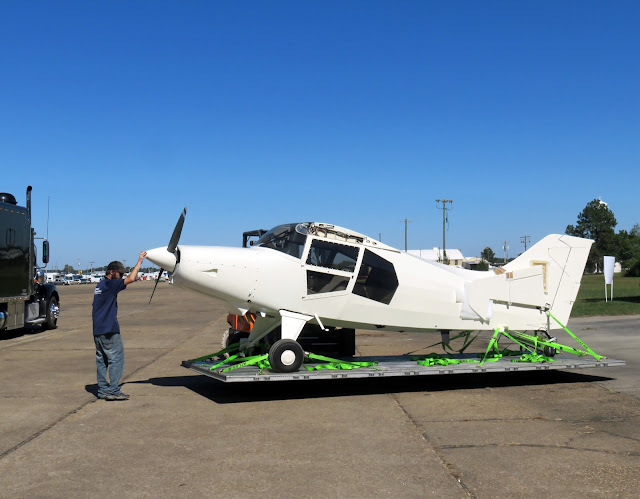 They are often used for bush planes, sightseeing trips, personal enjoyment, or necessity, like in the communities of northern Canada or Alaska that are only accessible by plane. You can see some performance videos here. The company was even featured on one of our favorite shows, How It's Made. Here, Marlaina takes a close-up look at the plane. 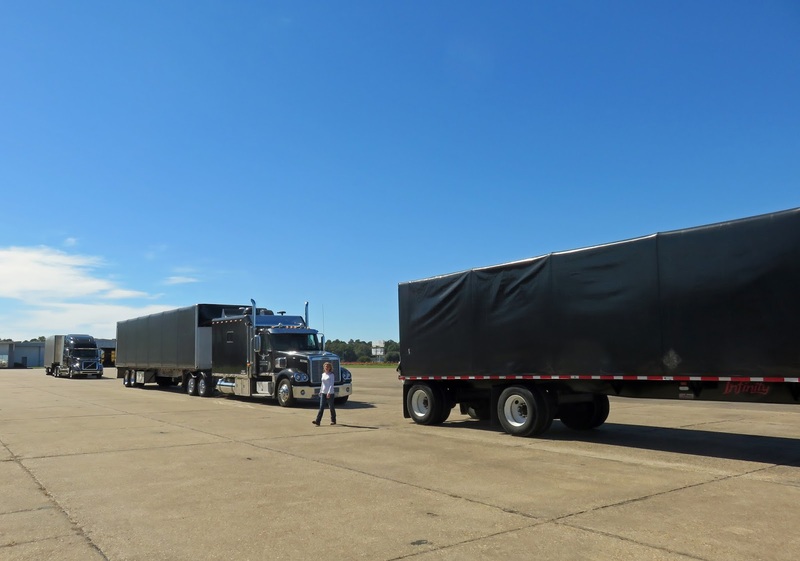 Below, you can see Marlaina and MacGyver's truck in the background getting ready to be loaded. 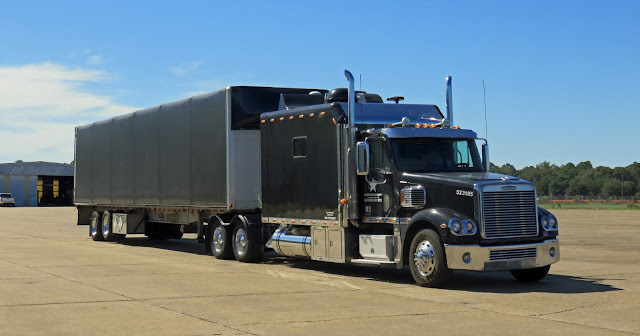 Once Ed was finished strapping the freight, he slid the curtain back in place and pulled forward to get out of their way. 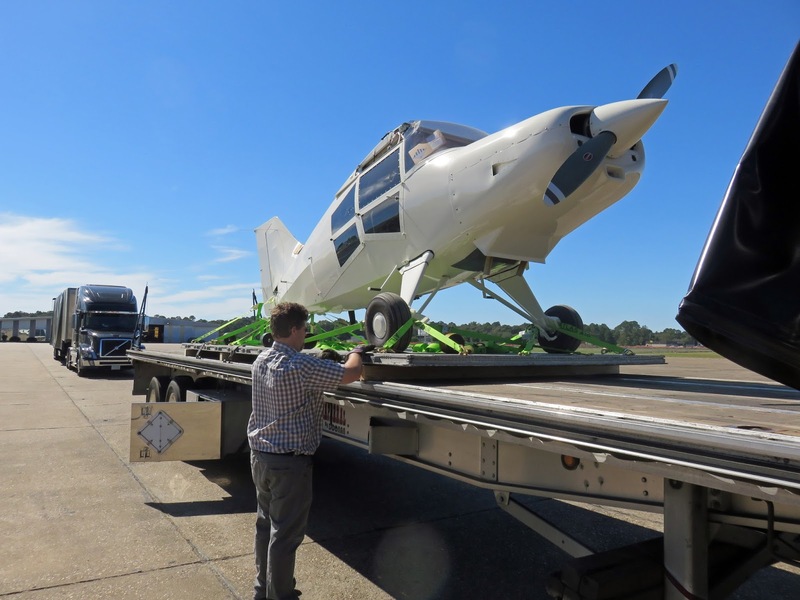 The planes needed to be at the airport to be loaded onto another plane (much bigger of course!) so they could begin their journey across the Atlantic. They decided to load the planes on Sunday so we'd all be ready to go first thing Monday. First thing turned out to be five o'clock in the morning. Which meant I had to get up at four to get ready, and then make ham, egg, and cheese sandwiches for everyone. Ed and MacGyver are very cranky in the morning if they don't have food and coffee. 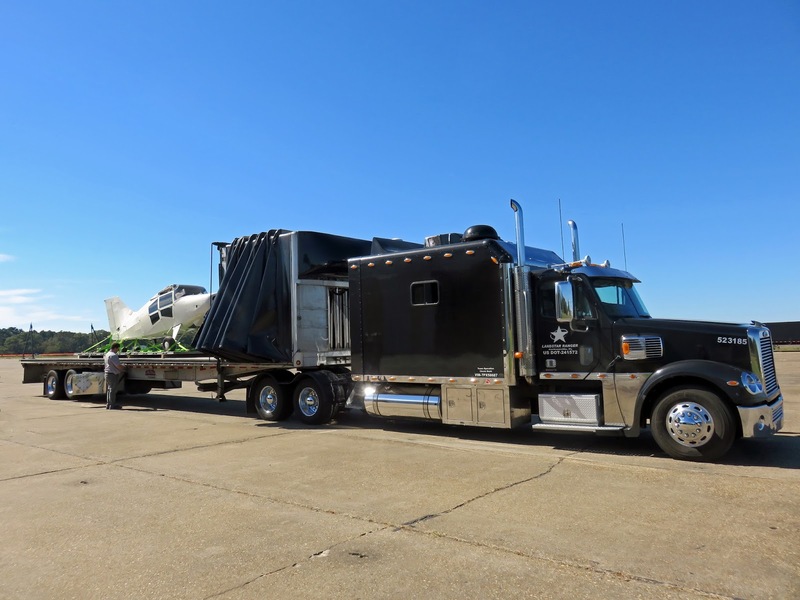 It also meant we'd all be spending the night on the air strip in front of the hangars, since there were no truck stops or parking facilities nearby. So...what better time to have a dinner party than when you're stuck at an air field for the night? There were five trucks and seven drivers - Marlaina and MacGyver, Ed and I, Bob, Ali, and Vladimir. I had originally planned dinner just for the four of us, as I always do when we're together, but how could I leave out the three other drivers knowing they'd be dining on fast food or microwave meals while we'd be eating my homemade deliciousness? So we set up a little al fresco dining area. 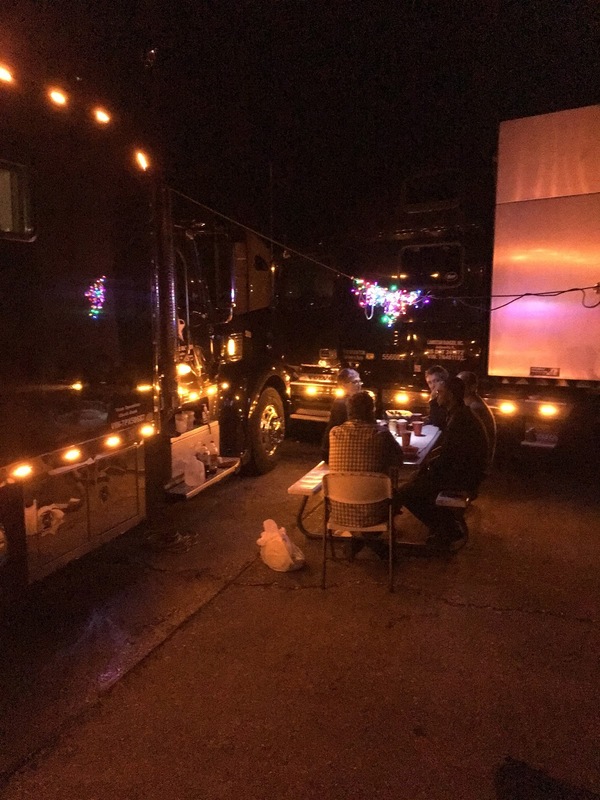 The boys dragged over a picnic table, positioned the trucks around it to shield us from the wind, and strung colorful Christmas lights above the table. 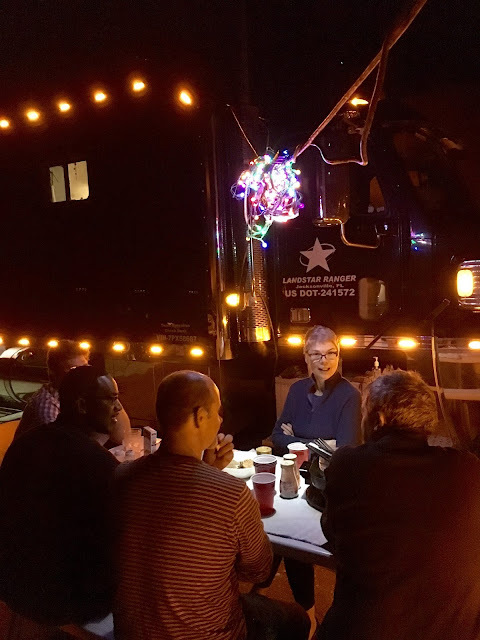 The glow from the string of lights and the running lights on the truck created the perfect outdoor dining atmosphere. I thought it was pretty spectacular. I've fed people from my truck before - 10 truckers at Port Hueneme a few years ago, watermelon for the guys working in the relentless heat, and our friends from Life With No Fixed Address whenever we get the chance to meet up, like last night when we live-streamed the Canadian elections to our TV - and I enjoy every minute of it. Dining at the air strip reminded me of a restaurant my father took me to over 20 years ago at a small, local airport in New York. It was called C.A.V.U. - Ceiling And Visibility Unlimited - an aviation term. Seems like the place is still around, operating under a different name now, but I thought about it when I was telling a family member about my little dinner party. I made a Mixed Green Salad with assorted dressings, Rosemary Pork Chops, Couscous, Roasted Cauliflower, and Sautéed Green Beans. We had a little "beverage bar" set up with ice cubes and filtered water, and a bottle each of Coke and Diet Coke that was leftover from lunch. Everyone seemed to enjoy the meal, the conversation was pleasant, and I don't think these drivers will forget this impromptu get together on the edge of an airstrip. This might be our new normal for outside dining, in agreeable weather of course. We already carry an extra chair for MacGyver (since we only have seating for three in the truck), who's to say we can't also get a folding table? Ed's going to have an aneurysm with all the extra crap I want to keep in the storage boxes. But hey, if you're gonna truck, you may as well do it in style. Our dinner party, was absolutely, the best not-really-trucking day, I have had in almost eight years on the road. 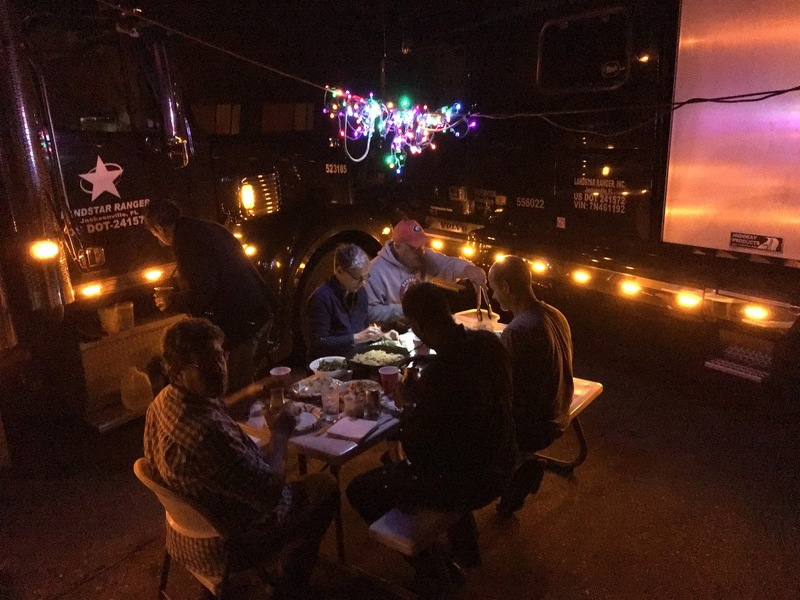 Fabulous meal, in an exclusive location, under the stars, and a chance to talk with our industry colleagues, solo drivers, that don't have generally time to sit down and chat. It was an amazing cross section of backgrounds, locales, experience. Everything. Thank you Ms Salena for making it all possible by providing the wonderful meal.